1173. SCOTLAND. Henry VIII. 's pardon to the Scots. See GRANTS IN MAY, No. 1. S.P. Hen. VIII., 229, f. 47. R.O. 1174. THE COUNCIL IN THE MARCHES OF WALES to HERON. Beg him, according to the King's special warrant, to pay their fees due at Lady Day the Annunciation last and also the half year's fees assigned to certain knights and squires of these parts; and to send the money by bearer, Humphrey Madeley. Ludlow, 1 May. Signed: C. Bothe, Uvedale Sir W., P. Newton, G. Bromley. P. 1. Add. : treasurer of the Chamber. ii. On the back: Madeley's receipt for the above fees. Westm., 10 May 4 Hen. VIII. Command of the army. See GRANTS IN MAY, Nos. 5, 48.
Review of the army. See GRANTS IN MAY, Nos. 6. S.P. Hen. VIII., 2, f. 111. R.O. 1176. [3231.] 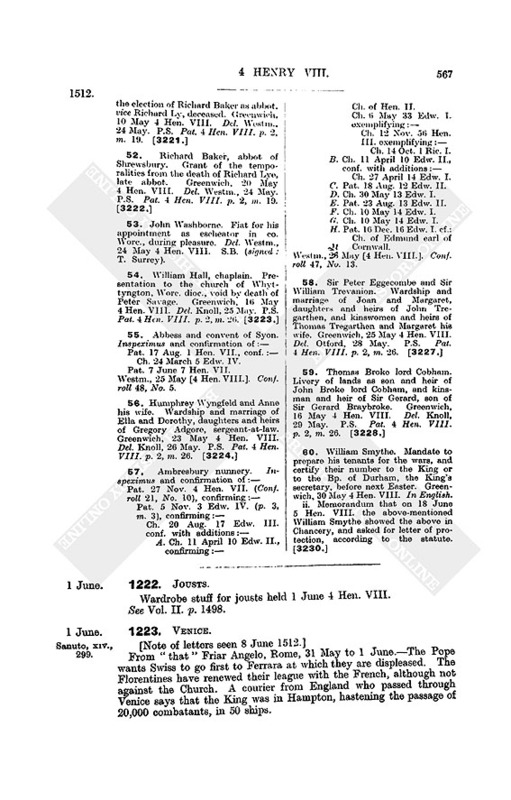 APPOINTMENTS FOR THE WAR. i. "The names of them which be appointed to go in their own persons, with the number of men which they have granted to bring with them, to serve the King's grace by land." The Lord Marquis (Dorset) Lieut.-Gen., Lord Ferres, (fn. 1) Lord Dudley with his son, Lord Broke,* Lord Willoughby,* Lord Hawarde,* with his brother Edmond and the Lord Treasurer's men, Sir Maurice Berkeley* (marshal), Sir Henry Willoughby,* (master of the Ordnance), Sir Wm. Sands* (treasurer of War), Sir Griffith Rice,* William Kingeston* (under marshal), Everard Digby and Nicholas Marland (under-masters of the Ordnance), Sir Robert Cotton's brother, Sir John Audeley, Sir Thomas Cornewale, Henry Sewerd, Geoffrey Gates, (fn. 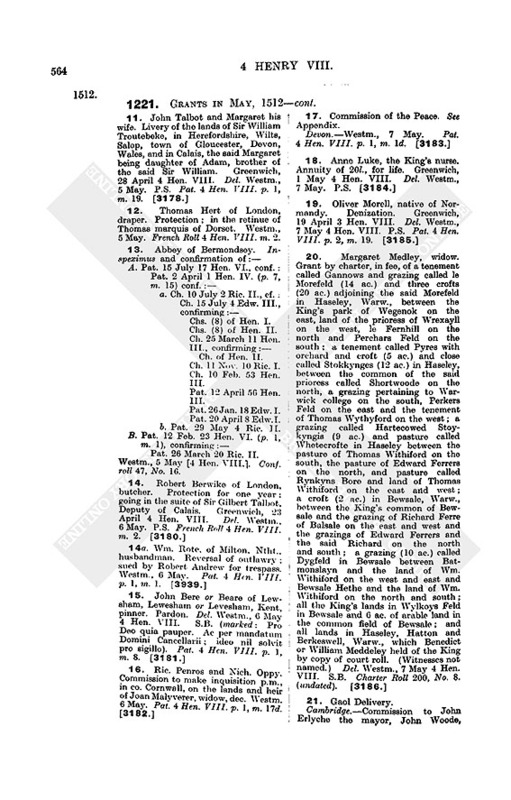 2) William Griffith, Edward Conwey, Thomas Cresset, Thomas Kynaston,† Sir Weston Browne's son, James Strangwish, John Dyve,† William Parre,† James Framyngham, Edward Chamberlayn,† William Morgan's brother,† William Fitzwilliam, John Melton, William Huse, Giles Capel, Edward Nevel,† Edward Don.† Number of men, &c., 4,769, of whom 33 are captains. 400 Almayns to be added. ii. "The names of lords and others with the number of men which they have granted to send to serve the King's grace by land," viz. :—The Duke of Buckingham, Earl of Shrewsbury, Lord Fitzwarren, Sir Thomas Lovel, Sir Henry Marny, Sir Rice ap Thomas, Sir John Huse, Sir Robert Poyntz, Sir Thomas Leighton, Sir Robert Corbet, Sir Adrian Fortescue, Sir William Rede, Sir Richard Fowler, Sir Andrew Windesore, Sir Edmonde Carewe, Sir William Fylol, Sir William Tirwit,† Sir Watier Hungerforde,† Sir Giles Alington, Sir John Savage, Sir Ralph Shirley, Edward Wadham, John Fortescue, Hampden of the Hyl. Sum of the soldiers granted, 1,410.
iii. "These persons whose names follow have the King's letters sent to them to make and send the numbers following, and to certify by a day to serve the King's grace by land," viz. :—Sir Alexander Baynham, 20; Sir Christopher Baynham, 20; Sir Thomas Blount, 12; Mr. Audeley, 12; Edward Belknap, 50; Edmund Bray, 20; Sir Thomas Cheyne, 20; William Essex, 10; Richard Restwold, 12; Sir George Foster, 12; Sir John Tyndale, 12; Thomas Lucas, 12; Everard Felding, 10; Thomas Fulshurst, 50; _ Dawne, 50; _ Salesbury, 50. Total, 382.
iv. "These be put in respite":—Tho. Trenchard, 30; _ Villers, 25. Total, 57. Sum total, 7,018; of whom granted to go in their own persons, 4,769; Almayns, 400; granted to send, 1,410; sent for by letters to send and certify, 382; put in respite, 57. Pp. 5. In Tuke's hand. S.P. Hen. VIII., 229, f. 48. R.O. 2. 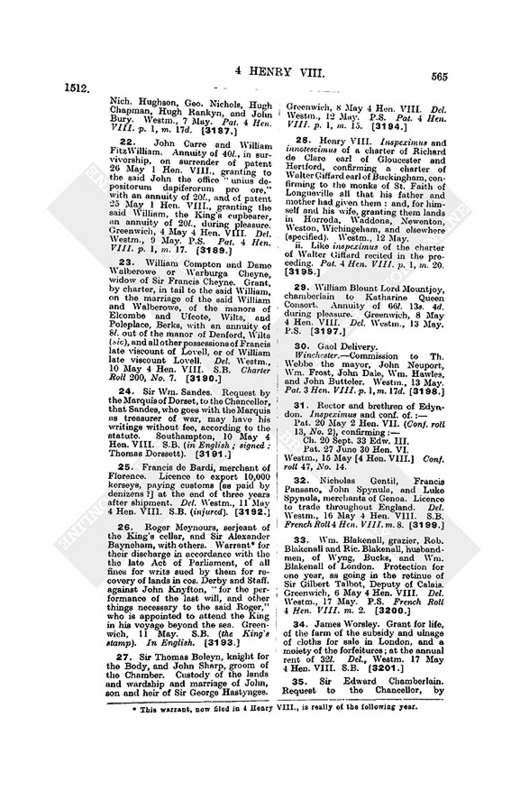 List of gentlemen, with numbers (in all 500), of their men " appointed to be in the retinue" of Sir William Sandes, viz. :—John Dyve, W. Par, Sir Th. Lovell, Sir Adrian Fortescue, Sir W. Rede, Sir Ric. Fouler, Sir Andrew Wyndesore, Sir Edm. Carew, Sir Wm. Tyrwyt, Sir Walter Hungerford, Sir Geoffrey Gates, Sir Giles Alington, Sir Ralph Shurley, John Fortescue, Hamden of the Hylle, the Lord Audeley, Sir Thomas Cheyny, Wm. Essex, Sir George Forster, Th. Lucas, Sir John Lysle. Signed: Thomas Dorssett, T. Docwra, Thomas Howard, Thomas Lawarr, Henry Wiat, Edward Ponynges, Sir D'd Owen. P.1. Numbers correspond with those of § 1. 3. List (fn. 3) of soldiers supplied by various gentlemen and towns [giving in each case the total number and the numbers of archers and bills respectively. In the margin are crosses and other marks]. 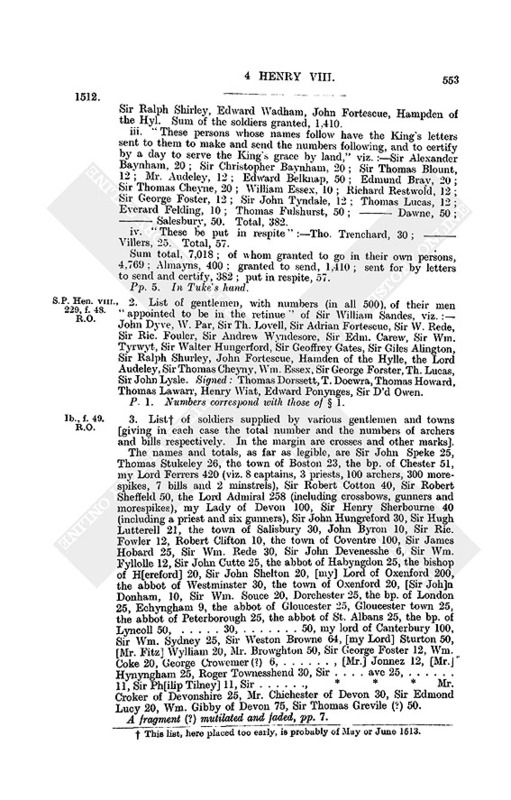 The names and totals, as far as legible, are Sir John Speke 25, Thomas Stukeley 26, the town of Boston 23, the bp. of Chester 51, my Lord Ferrers 420 (viz. 8 captains, 3 priests, 100 archers, 300 morespikes, 7 bills and 2 minstrels), Sir Robert Cotton 40, Sir Robert Sheffeld 50, the Lord Admiral 258 (including crossbows, gunners and morespikes), my Lady of Devon 100, Sir Henry Sherbourne 40 (including a priest and six gunners), Sir John Hungreford 30, Sir Hugh Lutterell 21, the town of Salisbury 30, John Byron 10, Sir Ric. Fowler 12, Robert Clifton 10, the town of Coventre 100, Sir James Hobard 25, Sir Wm. Rede 30, Sir John Devenesshe 6, Sir Wm. Fyllolle 12, Sir John Cutte 25, the abbot of Habyngdon 25, the bishop of H[ereford] 20, Sir John Shelton 20, [my] Lord of Oxenford 200, the abbot of Westminster 30, the town of Oxenford 20, [Sir Joh]n Donham, 10, Sir Wm. Souce 20, Dorchester 25, the bp. of London 25, Echyngham 9, the abbot of Gloucester 25, Gloucester town 25, the abbot of Peterborough 25, the abbot of St. Albans 25, the bp. of Lyncoll 50, ... 30, ... 50, my lord of Canterbury 100, Sir Wm. Sydney 25, Sir Weston Browne 64, [my Lord] Sturton 50, [Mr. Fitz] Wylliam 20, Mr. Browghton 50, Sir George Foster 12, Wm. Coke 20, George Crowemer (?) 6, ...,[Mr.] Jonnez 12, [Mr.] Hynyngham 25, Roger Townesshend 30, Sir ... ave 25, ... 11, Sir Ph[ilip Tilney] 11, Sir ..., *** Mr. Croker of Devonshire 25, Mr. Chichester of Devon 30, Sir Edmond Lucy 20, Wm. Gibby of Devon 75, Sir Thomas Grevile (?) 50. A fragment (?) mutilated and faded, pp. 7. Otho E. XI., 32. B.M. 4. List of those who have agreed to provide soldiers with the number each has "granted." On the first page these numbers are all lost by mutilation, the names still remaining being my [Lord] Ferres, the Lord Dudley with his so[n], the Lord Broke, (fn. 4) the Lord Willoughby,* the Lord Haward, Sir William Sandes, Sir Henry Willoughby, Sir Moryee Berkley, Sir Rob. Cotton with his brother, Sir Griffith Rice, "in the stead of Sir John Heydon," Sir John Shelton, Wm. Paston and Sir Ph. Calthrop, Henry Sewerd, Geoffrey Gates, Wm. Griffithe, Edw. Conwey, Th. Cresset, Th. Kynaston, James Strangwish, Sir Walter Hungerford. 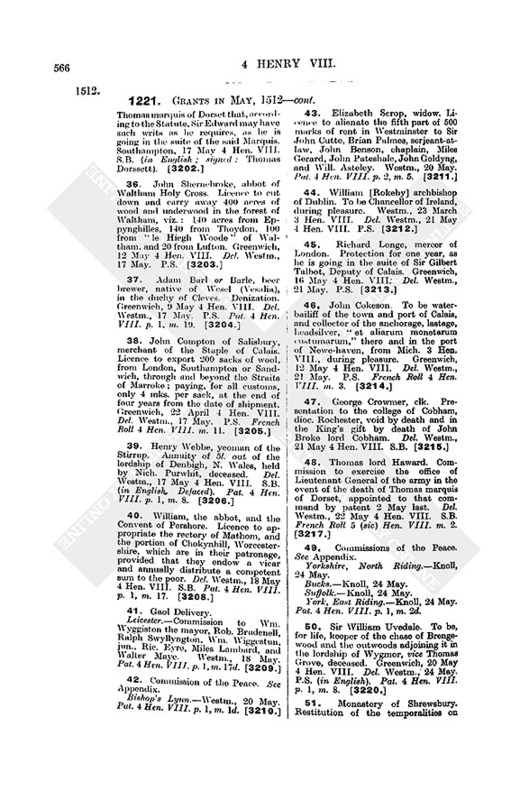 2nd page:—... Chamberlayn hath granted 20, ... Morgan with his brother 60, ... Fitzwilliam 20, ... Melton 60, _ (blank) Marlande, hath granted "himself," ... Huse 12, ... Capell 12. [A]lmayns, 400. 3rd page (numbers lost):—Sir Mathew Broun, Edmond Carewe, (fn. 5) Th. Trenchard, John Leeke, Edw. Wadham, Villers, Mr. Strange. "These be put in respite": Sir John Digby, Chr. Throgmerton, Rob. Strange,† Rob. Sutton. Pp. 3. Much injured by fire. Exch. Accts., 417 (6), f. 28. R.O. Warrant to the Great Wardrobe to deliver Sir Th. Knyvet, knight for the Body and master of the Horse, or George Lovekyn, clerk of the Stable, housing (described) for three hobbies. Greenwich, 2 May 4 Hen. VIII. From the Marquis of Mantua to the Proveditor Capello, Mantua, 3 May.—By letters of 25 April from France, the English herald had arrived and declared war, but was not allowed to do it in his tabard for fear of the people; the Emperor's ambassador had told the King of France of the truce between his master and Venice, and that the French must take no more towns in Italy; a new grand master of Milan, in place of the late Mons. de Foys, was coming from France. Italian. See Venetian Calendar, II, No. 158. Ven. Transcr., 176, p. 115. R.O. 1179. DOGE AND SENATE OF VENICE to their AMBASSADOR WITH THE POPE. 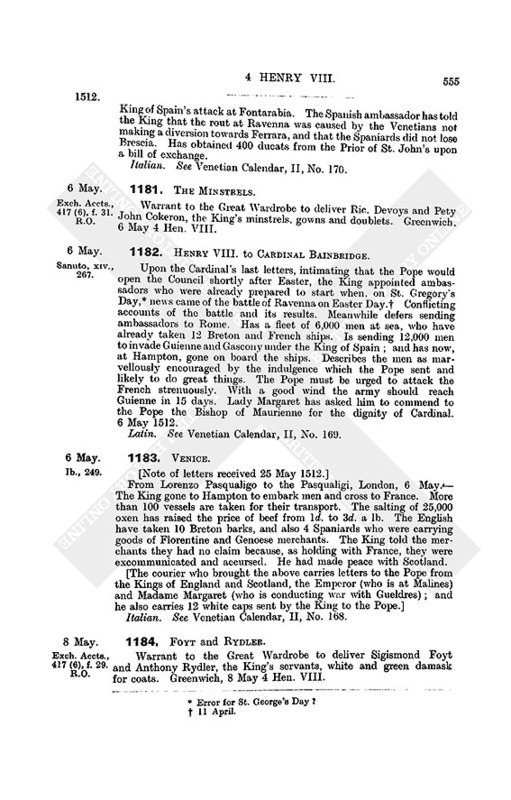 4 May 1512.—To get the Pope to hasten the Papal and Spanish reinforcements and the attack by Spain and England. 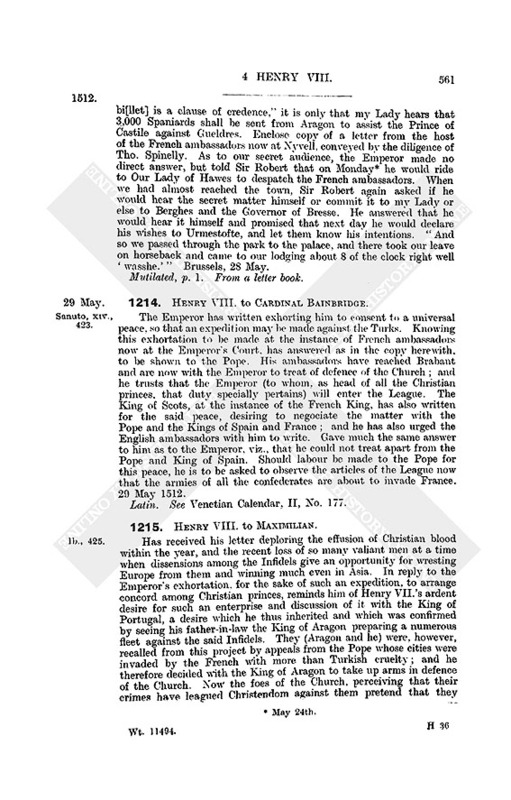 By letters of 1 April, the Ambassador in England writes that the men were to embark on the 3rd day of Easter (fn. 6); so that the Spanish ambassador was wrong in saying they were already embarked. Despatched a courier this morning with the Cardinal of York's letter, from whom the 50 ducats paid to this and 45 to the former courier are to be recovered. Italian. Modern extract. See Venetian Calendar, II, No. 156. From Andrea Badoer, [London], 23 and 29 April and 5 May.—Preparations against France, including infantry to join the King of Spain's attack at Fontarabia. The Spanish ambassador has told the King that the rout at Ravenna was caused by the Venetians not making a diversion towards Ferrara, and that the Spaniards did not lose Brescia. Has obtained 400 ducats from the Prior of St. John's upon a bill of exchange. Italian. See Venetian Calendar, II, No. 170. Exch. Accts., 417 (6), f. 31. R.O. Warrant to the Great Wardrobe to deliver Ric. Devoys and Pety John Cokeron, the King's minstrels, gowns and doublets. Greenwich. 6 May 4 Hen. VIII. 1182. HENRY VIII. to CARDINAL BAINBRIDGE. Upon the Cardinal's last letters, intimating that the Pope would open the Council shortly after Easter, the King appointed ambassadors who were already prepared to start when, on St. Gregory's Day, (fn. 7) news came of the battle of Ravenna on Easter Day. (fn. 8) Conflicting accounts of the battle and its results. Meanwhile defers sending ambassadors to Rome. Has a fleet of 6,000 men at sea, who have already taken 12 Breton and French ships. Is sending 12,000 men to invade Guienne and Gascony under the King of Spain; and has now, at Hampton, gone on board the ships. Describes the men as marvellously encouraged by the indulgence which the Pope sent and likely to do great things. The Pope must be urged to attack the French strenuously. With a good wind the army should reach Guienne in 15 days. Lady Margaret has asked him to commend to the Pope the Bishop of Maurienne for the dignity of Cardinal. 6 May 1512. Latin. See Venetian Calendar, II, No. 169. 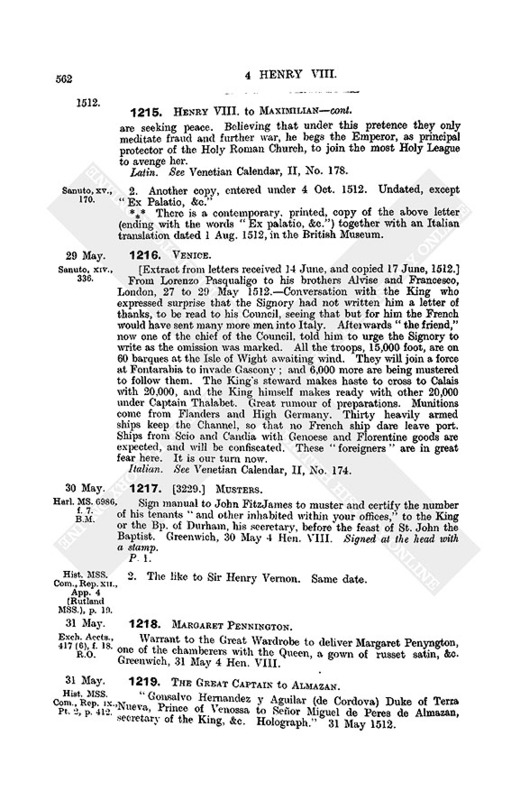 From Lorenzo Pasqualigo to the Pasqualigi, London, 6 May.—The King gone to Hampton to embark men and cross to France. More than 100 vessels are taken for their transport. The salting of 25,000 oxen has raised the price of beef from 1d. to 3d. a 1b. The English have taken 10 Breton barks, and also 4 Spaniards who were carrying goods of Florentine and Genoese merchants. The King told the merchants they had no claim because, as holding with France, they were excommunicated and accursed. He had made peace with Scotland. Italian. See Venetian Calendar, II, No. 168. Exch. Accts., 417 (6), f. 29. R.O. Warrant to the Great Wardrobe to deliver Sigismond Foyt and Anthony Rydler, the King's servants, white and green damask for coats. Greenwich, 8 May 4 Hen. VIII. Exch. Accts., 417 (6). f. 30. R.O. Warrant to the Great Wardrobe to deliver Somerset Herald "a coat of our arms beaten with fine gold upon damask fringed with red and blue silk." Greenwich, 8 May 4 Hen. VIII. Galba B. III., 15. B.M. 1186. [3188.] HENRY VIII. to [MAXIMILIAN]. Has commissioned his ambassador, Sir Robert Wingfield, to inform his Majesty of the reasons for which he has taken up arms against the enemies of the Church. Has had, for 5 days, forces for land and sea in readiness at Southampton, waiting for nothing but favourable winds. Has just heard of the disaster to the Pope and the King of Aragon at Ravenna, which threatens to place Naples, Italy, and Sicily, and indeed the whole of Christendom, at the mercy of their enemies. Doubts not the Emperor, as supreme protector of the Church, will act cordially with him in this just and necessary war. Promises not to desert the Emperor, or come to terms without his and the King of Aragon's consent. Greenwich, 8 May 1512. Lat., copy, mutilated, pp. 2. A translation is in Halliwell's Royal Letters, I, 199. Exch. Accts., 417 (6), f. 25. R.O. Warrant to the Great Wardrobe to pay for making two trappers of russet satin, &c. Greenwich, 9 May 4 Hen. VIII. Would be glad to hear the news. Wishes to know if Julius is Julius indeed. Has made a vow for the success of the Church. Will make a pilgrimage to Walsingham and hang a Greek ode there. Whenever Ammonius goes to Walsingham he is to inquire for it. Bovil is hard at Greek. Sends his compliments to John [Colet] "omnis humanitatis antistitem." Is to thank D. Carmilianus for having made in his letters to Brian such honorable mention of Erasmus, styling him doctorum doctissimus. Cambridge, 7 id. Maii 1509. S.P. Hen. VIII., 229, f. 53. R.O. Bill of receipt, 10 May 4 Hen. VIII., by George Sybsay and Wm. 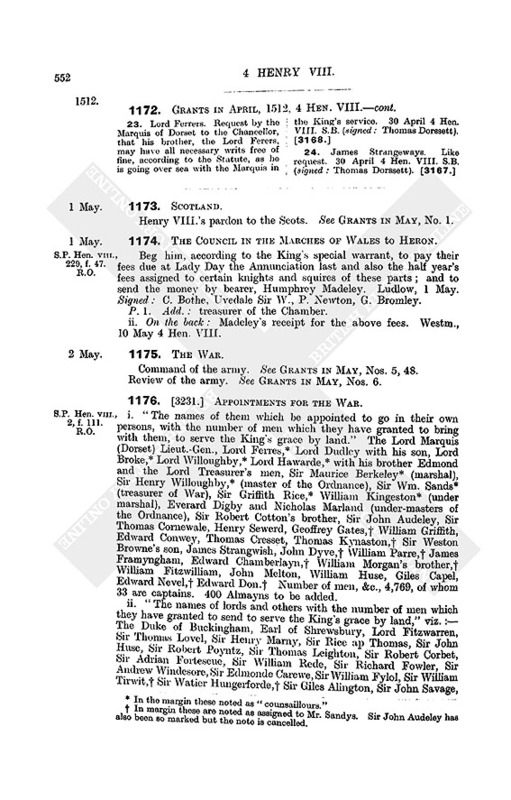 Persone, captains of Lord Wyllughby's ships, from Nicholas Merleynd, captain of the Mary of Walsingham, of certain bills, morispikes, gunstones and hackbushes, to be returned on demand. 1190. THE CITY OF RAGUSA to JULIUS II. To-day their messengers (nuntii) have come from Constantinople, bringing letters written by their ambassadors there, 21 April, informing them that Selim Sach, the younger son of the Great Turk, who last year attacked his father and was put to flight, had arrived at Constantinople on the 17th of the said month with 2,000 men of his court, induced by his favour with the Janizaries. He was met, two miles from the gates by all the "bassalarii," the other pashas (bassæ) and all the grandees, with great ceremony. On Friday, 23 April, he was made Emperor by the Janizaries, to the great displeasure of his father, who was induced to yield by his pashas and the Janizaries. Next day he entered the palace to his father, from whom he received the insignia of Empire and sat the whole day on the throne, receiving the homage of all the princes. His elder brother, Achmet Solhtan, who aspired to the throne by reason of his father's promise, occupies nearly all Natelia, and by favour of that nation called Soffiani, and of the Cilicians, is said to have an army of 40,000 horse and 30,000 foot. What will come of it, is doubtful. The father has exhorted the new Emperor not to take arms against his brother, while he is alive. He will spend the remainder of his life at Motica, his native place, in retirement. Ragusa, 11 May 1512. From the Ambassador at Rome, 12 May.—Second session of Lateran Council (briefly described). At the 3rd session, on the 17th. 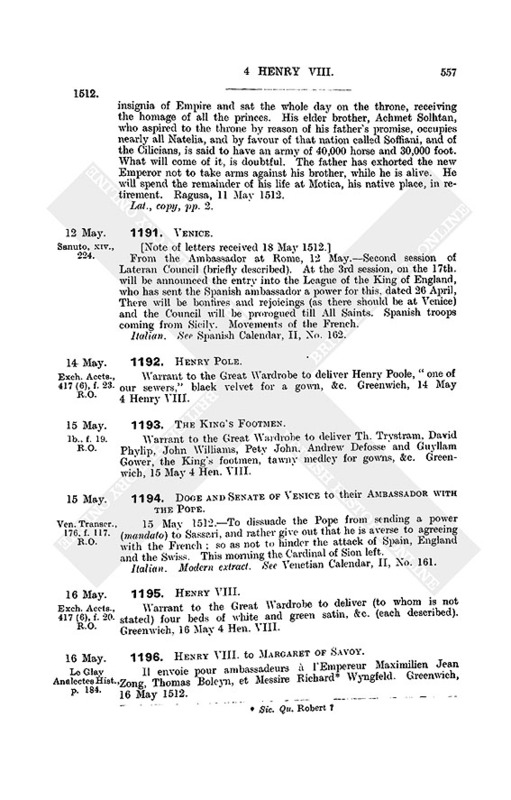 will be announced the entry into the League of the King of England, who has sent the Spanish ambassador a power for this, dated 26 April, There will be bonfires and rejoicings (as there should be at Venice) and the Council will be prorogued till All Saints. Spanish troops coming from Sicily. Movements of the French. Italian. See Spanish Calendar, II, No. 162. Exch. Accts., 417 (6), f. 23. R.O. Warrant to the Great Wardrobe to deliver Henry Poole, "one of our sewers," black velvet for a gown, &c. Greenwich, 14 May 4 Henry VIII. Warrant to the Great Wardrobe to deliver Th. Trystram, David Phylip, John Williams, Pety John, Andrew Defosse and Guyllam Gower, the King's footmen, tawny medley for gowns, &c. Greenwich, 15 May 4 Hen. VIII. Ven. Transer., 176, f. 117. R.O. 1194. DOGE AND SENATE OF VENICE to their AMBASSADOR WITH THE POPE. 15 May 1512.—To dissuade the Pope from sending a power (mandato) to Sassari, and rather give out that he is averse to agreeing with the French; so as not to hinder the attack of Spain, England and the Swiss. This morning the Cardinal of Sion left. Italian. Modern extract. See Venetian Calendar, II, No. 161. Exch. Accts., 417 (6), f. 20. R.O. Warrant to the Great Wardrobe to deliver (to whom is not stated) four beds of white and green satin, &c. (each described). Greenwich, 16 May 4 Hen. VIII. Le Glay Analectes Hist., p. 184. 1196. HENRY VIII. to MARGARET OF SAVOY. Il envoie pour ambassadeurs à l'Empereur Maximilien Jean Zong, Thomas Boleyn, et Messire Richard (fn. 9) Wyngfeld. Greenwich, 16 May 1512. Galba B. III., 12b. B.M. 1197. [3207.] MARGARET OF SAVOY to HENRY VIII. 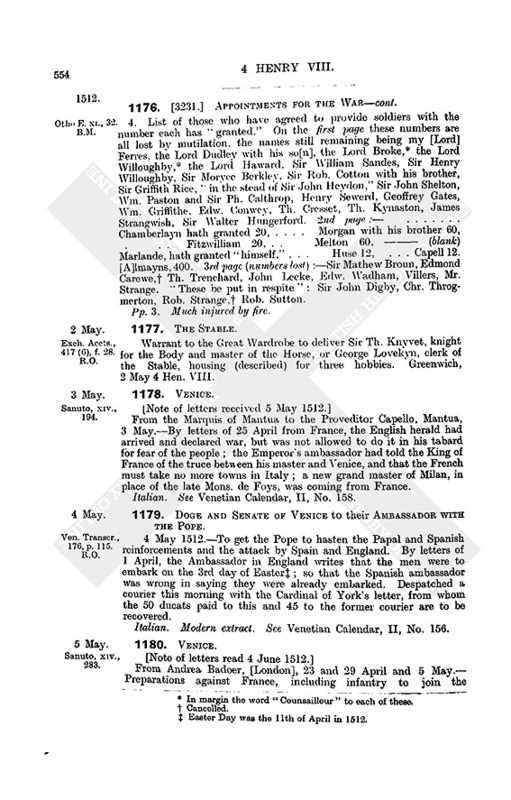 Requests letters patent permitting Carlos, brother of John Baptista Ugochoni, a Florentine, married at Burgos in Castille, to reside in London. Desires to help him for services done to the late King, her brother. Brussells, 18 May 1512. Signed. See Venetian Calendar, II, No. 163. Exch. Accts., 417 (6), f. 24. R.O. 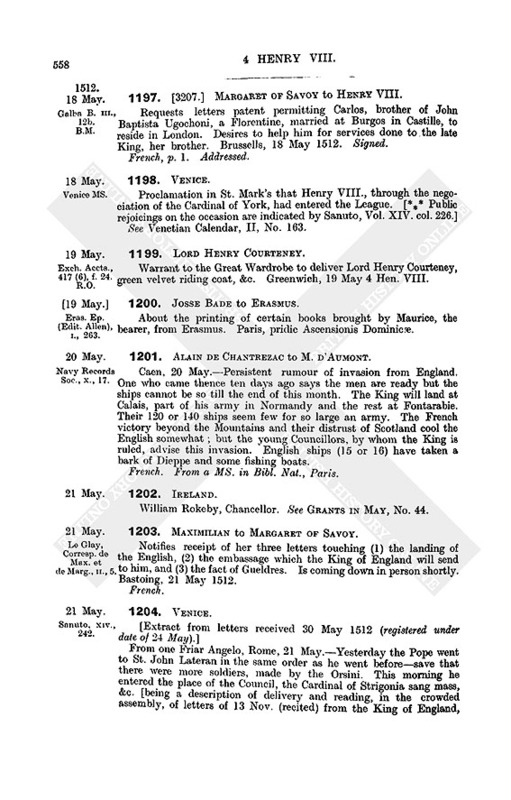 Warrant to the Great Wardrobe to deliver Lord Henry Courteney, green velvet riding coat, &c. Greenwich, 19 May 4 Hen. VIII. Eras. Ep. (Edit. Allen), I., 263. 1120. JOSSE BADE to ERASMUS. About the printing of certain books brought by Maurice, the bearer, from Erasmus. Paris, pridie Ascensionis Dominicæ. Navy Records Soc., X., 17. 1201. ALAIN DE CHANTREZAC to M. D'AUMONT. Caen, 20 May.—Persistent rumour of invasion from England. One who came thence ten days ago says the men are ready but the ships cannot be so till the end of this month. The King will land at Calais, part of his army in Normandy and the rest at Fontarabie. Their 120 or 140 ships seem few for so large an army. The French victory beyond the Mountains and their distrust of Scotland cool the English somewhat; but the young Councillors, by whom the King is ruled, advise this invasion. English ships (15 or 16) have taken a bark of Dieppe and some fishing boats. French. From a MS. in Bibl. Nat., Paris. William Rokeby, Chancellor. See GRANTS IN MAY, No. 44. Le Glay, Corresp. de Max. et de Marg., II., 5. 1203. MAXIMILIAN to MARGARET OF SAVOY. 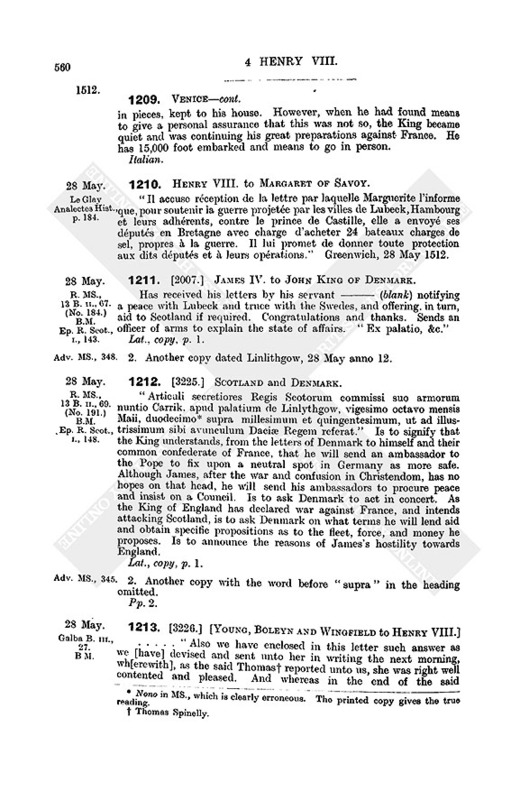 Notifies receipt of her three letters touching (1) the landing of the English, (2) the embassage which the King of England will send to him, and (3) the fact of Gueldres. Is coming down in person shortly. Bastoing, 21 May 1512. From one Friar Angelo, Rome, 21 May.—Yesterday the Pope went to St. John Lateran in the same order as he went before—save that there were more soldiers, made by the Orsini. This morning he entered the place of the Council, the Cardinal of Strigonia sang mass, &c. [being a description of delivery and reading, in the crowded assembly, of letters of 13 Nov. (recited) from the King of England, entering the League, and from the King of Spain appointing his ambassador as proctor for himself and the Queen of Castile in proceeding against the schismatic conventicle of Pisa; also of the Council's prorogation to 4 Nov.]. The Pope will stay to-night at St. Peter ad Vincula and to-morrow return to St. Peter's. Thus far until to-day, which is 17 May. [P.S., 21 May. ]—Spanish soldiers again passing towards Bologna. One hundred French lances have been recalled to succour France against England. The Lord of Carpi is coming as ambassador of the Emperor; also a French ambassador, chief of the Parliament of Milan, is coming and has reached Florence. It is hoped that the Pope will not make peace with France. Prospero Colonna gone to Naples. The King of Spain's words on the death of Gaston de Foix. The vicar general of the Servites deposed. On Monday evening were rejoicings for the league with England. Some of the Colonna faction joining the Pope. The Emperor likely to enter the League. Italian. Modern transcript. See Venetian Calendar, II, Nos. 165–6. Exch. Accts., 417 (6), f. 15. R.O. Warrant to the Great Wardrobe to deliver John Syngleton, Ric. Donnall, Ric. Symson and John Williams, "chyldren of our Lease," coats of motley, &c. Greenwich, 22 May 4 Hen. VIII. Calig. B. VI., 27. B.M. 1206. [3218.] FRANCE AND SCOTLAND. (1) For mutual help against the attempts of England. (2) That in the event of war, immediately on receiving notification from Scotland, France shall levy war on England; and vice versa. (3) That the subjects of neither state shall be allowed to serve or give aid to England; nor (4) harborage be afforded to rebels by either. (5) No truce to be formed with England without mutual consent. (6) Neither to enter into any truce with England unless both be comprehended. (7) In case either King die without legitimate heirs, and the succession be disputed, the survivor is not to interfere or allow of interference by foreign states, but suffer the nobles of the Kingdom to settle the matter according to the laws. (8) The above to be ratified by the Pope. 22 May 1512. Latin. Copy in a later hand, pp. 9. Election. See GRANTS IN MAY, Nos. 51, 52. K.R. Misc. Book, 124, p. 192. R.O. 1208. [3169.] FIFTEENTHS AND TENTHS. Memorandum of receipt, Easter term 4 Hen. VIII. of 20l. 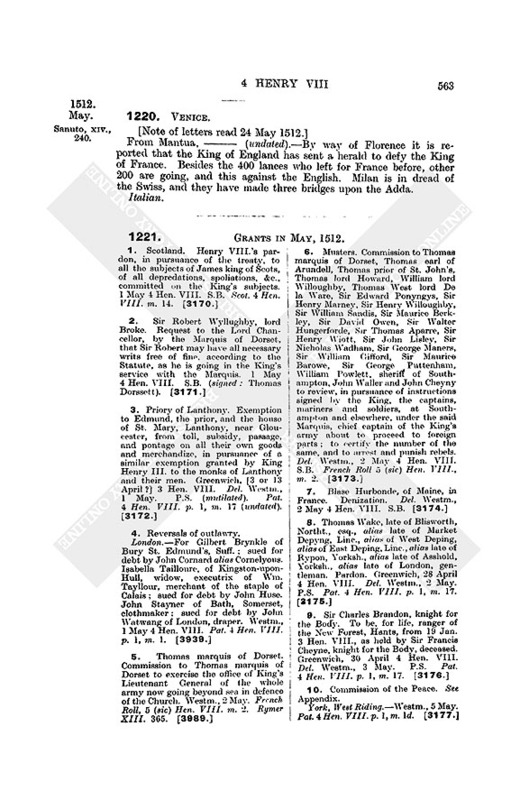 from laity of London for the first fifteenth and tenth granted in 3 Hen. VIII. Latin. On back of an account of receipts and payments in the Exchequer of Henry VII. 's time. Compare Vol. III, No. 627. From Andrea Badoer, London, 26 May.—Florentines have roused the King's indignation against the Signory by saying that the Pope and they had agreed with France, so that Badoer, fearing to be cut in pieces, kept to his house. However, when he had found means to give a personal assurance that this was not so, the King became quiet and was continuing his great preparations against France. He has 15,000 foot embarked and means to go in person. 1210. HENRY VIII. to MARGARET OF SAVOY. "Il accuse réception de la lettre par laquelle Marguerite l'informe que, pour soutenir la guerre projetée par les villes de Lubeck, Hambourg et leurs adhérents, contre le prince de Castille, elle a envoyé ses députés en Bretagne avec charge d'acheter 24 bateaux charges de sel, propres à la guerre. Il lui promet de donner toute protection aux dits députés et à leurs opérations." Greenwich, 28 May 1512. R. MS. 13 B. II., 67. (No. 184.) B.M. Ep. R. Scot., I., 143. 1211. [2007.] JAMES IV. to JOHN KING OF DENMARK. Has received his letters by his servant _ (blank) notifying a peace with Lubeck and truce with the Swedes, and offering, in turn, aid to Scotland if required. Congratulations and thanks. Sends an officer of arms to explain the state of affairs. "Ex palatio, &c."
2. Another copy dated Linlithgow, 28 May anno 12. R. MS., 13 B. II., 69. (No. 191.)B.M. Ep. R. Scot., I., 148. 1212. [3225.] SCOTLAND and DENMARK. "Articuli secretiores Regis Scotorum commissi suo armorum nuntio Carrik, apud palatium de Linlythgow, vigesimo octavo mensis Maii, duodecimo (fn. 10) supra millesimum et quingentesimum, ut ad illustrissimum sibi avunculum Daciæ Regem referat." Is to signify that the King understands, from the letters of Denmark to himself and their common confederate of France, that he will send an ambassador to the Pope to fix upon a neutral spot in Germany as more safe. Although James, after the war and confusion in Christendom, has no hopes on that head, he will send his ambassadors to procure peace and insist on a Council. Is to ask Denmark to act in concert. As the King of England has declared war against France, and intends attacking Scotland, is to ask Denmark on what terms he will lend aid and obtain specific propositions as to the fleet, force, and money he proposes. Is to announce the reasons of James's hostility towards England. 2. Another copy with the word before "supra" in the heading omitted. Galba B. III., 27. B.M. ... "Also we have enclosed in this letter such answer as we [have] devised and sent unto her in writing the next morning, wh[erewith], as the said Thomas (fn. 11) reported unto us, she was right well contented and pleased. And whereas in the end of the said bi[llet] is a clause of credence," it is only that my Lady hears that 3,000 Spaniards shall be sent from Aragon to assist the Prince of Castile against Gueldres. Enclose copy of a letter from the host of the French ambassadors now at Nyvell, conveyed by the diligence of Tho. Spinelly. As to our secret audience, the Emperor made no direct answer, but told Sir Robert that on Monday (fn. 12) he would ride to Our Lady of Hawes to despatch the French ambassadors. When we had almost reached the town, Sir Robert again asked if he would hear the secret matter himself or commit it to my Lady or else to Berghes and the Governor of Bresse. He answered that he would hear it himself and promised that next day he would declare his wishes to Urmestofte, and let them know his intentions. "And so we passed through the park to the palace, and there took our leave on horseback and came to our lodging about 8 of the clock right well 'wasshe.'" Brussels, 28 May. Mutilated, p. 1. From a letter book. 1214. HENRY VIII. to CARDINAL BAINBRIDGE. The Emperor has written exhorting him to consent to a universal peace, so that an expedition may be made against the Turks. Knowing this exhortation to be made at the instance of French ambassadors now at the Emperor's Court, has answered as in the copy herewith, to be shown to the Pope. His ambassadors have reached Brabant and are now with the Emperor to treat of defence of the Church; and he trusts that the Emperor (to whom, as head of all the Christian princes, that duty specially pertains) will enter the League. The King of Scots, at the instance of the French King, has also written for the said peace, desiring to negociate the matter with the Pope and the Kings of Spain and France; and he has also urged the English ambassadors with him to write. Gave much the same answer to him as to the Emperor, viz., that he could not treat apart from the Pope and King of Spain. Should labour be made to the Pope for this peace, he is to be asked to observe the articles of the League now that the armies of all the confederates are about to invade France. 29 May 1512. Latin. See Venetian Calendar, II, No. 177. 1215. HENRY VIII. to MAXIMILIAN. Has received his letter deploring the effusion of Christian blood within the year, and the recent loss of so many valiant men at a time when dissensions among the Infidels give an opportunity for wresting Europe from them and winning much even in Asia. In reply to the Emperor's exhortation, for the sake of such an expedition, to arrange concord among Christian princes, reminds him of Henry VII. 's ardent desire for such an enterprise and discussion of it with the King of Portugal, a desire which he thus inherited and which was confirmed by seeing his father-in-law the King of Aragon preparing a numerous fleet against the said Infidels. They (Aragon and he) were, however, recalled from this project by appeals from the Pope whose cities were invaded by the French with more than Turkish cruelty; and he therefore decided with the King of Aragon to take up arms in defence of the Church. Now the foes of the Church, perceiving that their crimes have leagued Christendom against them pretend that they are seeking peace. Believing that under this pretence they only meditate fraud and further war, he begs the Emperor, as principal protector of the Holy Roman Church, to join the most Holy League to avenge her. Latin. See Venetian Calendar, II, No. 178. 2. Another copy, entered under 4 Oct. 1512. Undated, except "Ex Palatio, &c."
* There is a contemporary, printed, copy of the above letter (ending with the words "Ex palatio, &c.") together with an Italian translation dated 1 Aug. 1512, in the British Museum. [Extract from letters received 14 June, and copied 17 June, 1512.] From Lorenzo Pasqualigo to his brothers Alvise and Francesco, London, 27 to 29 May 1512.—Conversation with the King who expressed surprise that the Signory had not written him a letter of thanks, to be read to his Council, seeing that but for him the French would have sent many more men into Italy. Afterwards "the friend," now one of the chief of the Council, told him to urge the Signory to write as the omission was marked. All the troops, 15,000 foot, are on 60 barques at the Isle of Wight awaiting wind. They will join a force at Fontarabia to invade Gascony; and 6,000 more are being mustered to follow them. The King's steward makes haste to cross to Calais with 20,000, and the King himself makes ready with other 20,000 under Captain Thalabet. Great rumour of preparations. Munitions come from Flanders and High Germany. Thirty heavily armed ships keep the Channel, so that no French ship dare leave port. Ships from Scio and Candia with Genoese and Florentine goods are expected, and will be confiscated. These "foreigners" are in great fear here. It is our turn now. Italian. See Venetian Calendar, II, No. 174. Harl. MS. 6986, f. 7. B.M. Sign manual to John FitzJames to muster and certify the number of his tenants "and other inhabited within your offices," to the King or the Bp. of Durham, his secretary, before the feast of St. John the Baptist. Greenwich, 30 May 4 Hen. VIII. Signed at the head with a stamp. Com., Rep. XII., App. 4 (Rutland MSS. ), p. 19. 2. The like to Sir Henry Vernon. Same date. Exch. Accts., 417 (6), f. 18. R.O. Warrant to the Great Wardrobe to deliver Margaret Penyngton, one of the chamberers with the Queen, a gown of russet satin, &c. Greenwich, 31 May 4 Hen. VIII. Hist. MSS. Com., Rep. IX., Pt. 2, p. 412. 1219. THE GREAT CAPTAIN to ALMAZAN. "Gonsalvo Hernandez y Aguilar (de Cordova) Duke of Terra Nueva, Prince of Venossa to Señor Miguel de Peres de Almazan, secretary of the King, &c. Holograph." 31 May 1512. From Mantua, _ (undated).—By way of Florence it is reported that the King of England has sent a herald to defy the King of France. Besides the 400 lances who left for France before, other 200 are going, and this against the English. Milan is in dread of the Swiss, and they have made three bridges upon the Adda. 1221. 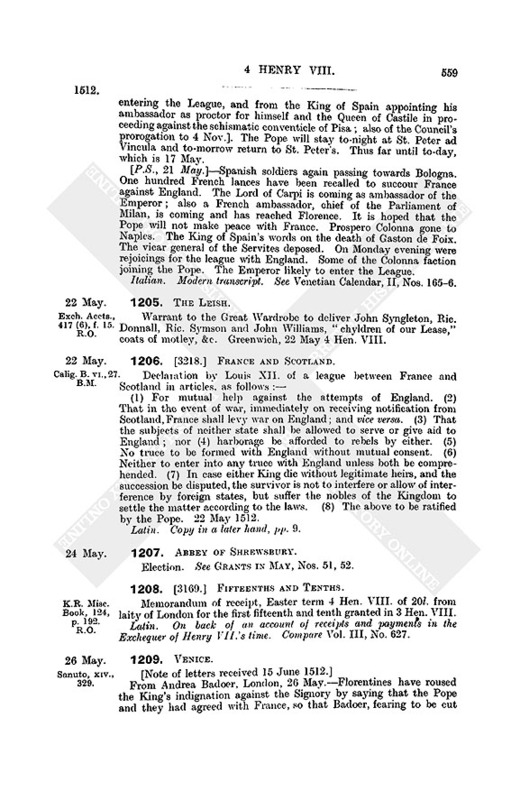 GRANTS IN MAY, 1512. 10. Commission of the Peace. See Appendix. 12. Thomas Hert of London, draper. Protection; in the retinue of Thomas marquis of Dorset. Westm., 5 May. French Roll 4 Hen. VIII. m. 2. Chs. (8) of Hen. I.
Chs. (8) of Hen. II. Ch. 11 Nov. 10 Ric. I.
Ch. 10 Feb. 53 Hen. III. Pat. 12 April 56 Hen. III. Pat. 26 Jan. 18 Edw. I.
Pat. 20 April 8 Edw. I.
b. Pat. 29 May 4 Ric. II. Pat. 26 March 20 Ric. II. Westm., 5 May [4 Hen. VIII.]. Conf. roll 47, No. 16. 17. Commission of the Peace. See Appendix. 28. Henry VIII. Inspeximus and innotescimus of a charter of Richard de Clare earl of Gloucester and Hertford, confirming a charter of Walter Giffard earl of Buckingham, confirming to the monks of St. Faith of Longueville all that his father and mother had given them; and, for himself and his wife, granting them lands in Horroda, Waddona, Newenton, Weston, Wichingeham, and elsewhere (specified). Westm., 12 May. Ch. 20 Sept. 33 Edw. III. Pat. 27 June 30 Hen. VI. Westm., 15 May [4 Hen. VIII.] Conf. roll 47, No. 14. 42. Commission of the Peace. See Appendix. 49. Commissions of the Peace. See Appendix. Yorkshire, North Riding.—Knoll, 24 May. York, East Riding.—Knoll, 24 May. Pat. 4 Hen. VIII. p. 1, m. 2d. 53. John Washborne. Fiat for his appointment as escheator in co. Worc., during pleasure. Del. Westm., 24 May 4 Hen. VIII. S.B. (signed: T. Surrey). Ch. 24 March 5 Edw. IV. Pat. 7 June 7 Hen. VII. Westm., 25 May [4 Hen. VIII.]. Conf. roll 48, No. 5. Ch. 12 Nov. 56 Hen. Ch. 14 Oct. 1 Ric. I.
Ch. 27 April 14 Edw. I.
C. Pat. 18 Aug. 12 Edw. II. D. Ch. 30 May 13 Edw. I.
E. Pat. 23 Aug. 13 Edw. II. F. Ch. 10 May 14 Edw. I.
G. Ch. 10 May 14 Edw. I.
Ch. of Edmund earl of Cornwall. Westm., 26 May [4 Hen. VIII.]. Conf. roll 47, No. 13. 60. William Smythe. Mandate to prepare his tenants for the wars, and certify their number to the King or to the Bp. of Durham, the King's secretary, before next Easter. Greenwich, 30 May 4 Hen. VIII. In English. 1. In the margin these noted as "counsaillours." 2. In margin these are noted as assigned to Mr. Sandys. Sir John Audeley has also been so marked but the note is cancelled. 3. This list, here placed too early, is probably of May or June 1513. 4. In margin the word "Counsaillour" to each of these. 6. 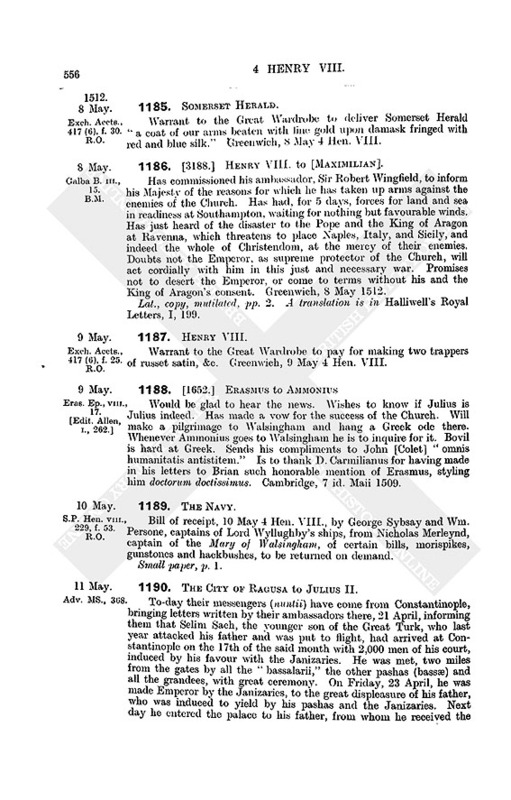 Easter Day was the 11th of April in 1512. 7. Error for St. George's Day ? 9. Sic. Qu. Robert ? 10. Nono in MS., which is clearly erroneous. The printed copy gives the true reading. 13. This warrant, now filed in 4 Henry VIII., is really of the following year.